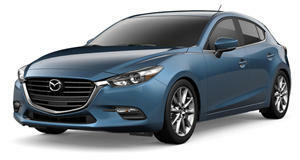 Have you ever seen a Mazda in Soul Crystal Red and wondered why it looks so good? Why the paint looks alive, like it’s moving with the shadows and defiantly reflecting the sharp edges of buildings like a funhouse mirror? Well that’s because Mazda is one of the few automakers that still builds attainable cars and injects them with the human touch. Even the paint robots in Mazda factories lay each coat using a pattern derived from the movements of a master painter rather than an algorithm. It’s why when Mazda invited me to Lake Tahoe’s Squaw Valley in Northern California to drive the AWD Mazda3 sedan and hatch, curiosity meant I could hardly say no. A lot of that has to do with the fact that my last experience in a Mazda with a "3’” on its badge was in a CX-3. Comfort, though, is only part of the picture. Visually, the fourth generation of Mazda3 takes an evolutionary step ahead by deepening the brand’s commitment to the KODO design language. To do so, Mazda gave the sedan and hatchback a defragmented mesh grille and thinner LED headlights before bringing out the chisel. Tool in hand, it went about thinning round body panels and sharpening accent lines on the hood and rear end. Then it did the opposite with the beltline, softening the transition between the car’s visual heft and the lighter greenhouse. Though the sedan and hatch have plenty in common, Mazda built each to appeal to vastly different audiences. The hatch is the sportiest of the two by far, using black accents, where the sedan uses chrome, and donning C-pillars thicker than a bowl of cold oatmeal to round out the rear and make it look playful.